In order for our customers to get the best print experience possible with us, we have to make sure that everyone who works for instantprint is at the top of their game. Not only do we invest in the latest in print technology, but we also take the time to train our colleagues to the best of their ability so that our customers can reach their customers with print that shows just how amazing they are! In celebration of our colleagues’ growth, we went behind the scenes to find out more about their instantprint journeys. 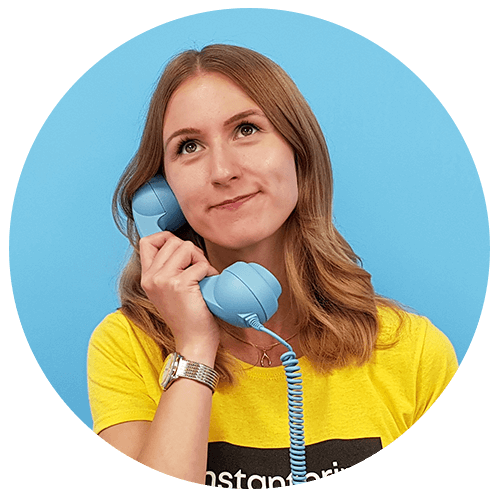 We spoke to our LiveChat Team Leader, Jasmin, to discover how she keeps on top of all customer queries through the website and what her best memories of working here are. I lead the LiveChat team here on the instantprint Customer Service team. On a day-to-day basis, my role consists of supporting the team with everything and anything they need when helping customers on the website. The part I love the most is chatting to our customers online because it’s so rewarding when I can make a difference to someone’s print journey. I started in August 2015, just over 3 years ago! When I started working at instantprint we didn’t have a LiveChat team, it made sense for an online printer to have an online chat function so we went for it and it’s been a great success. It’s because of this change that I’m where I am today, so for me it was huge! The training has been so varied and interesting. I’ve had the opportunity to learn about the different aspects of the company, such as how the production process works. The training is always ongoing, which is important as it keeps us up to date with new products and production developments, so we’ve always got the latest information to tell customers if they have any queries. I can’t put my finger on one specific thing that’s kept me here; there are so many! The amazing people who work here definitely go towards making every day here great. Christmas Eve 2017 consisted of puppies and pizza! Bryan, one of the directors, got us pizza and Adam, one of the co-founders of instantprint, brought in his puppy – this was definitely the best Christmas Eve I’ve ever worked! The volume of live chats we get through in a day can be quite high; as a team, we frequently deal with over 400 chats per day. We manage these by finding efficient ways to handle each chat and by making sure all our staff are well-equipped with great product knowledge to offer quick support. I’ve learnt so much! I started here at instantprint with no print knowledge at all, and now I find myself in the pub on a Saturday evening having a good feel of the menus to determine the paper stock and finish! I’ve grown to love the world of print whilst gaining new skills in the customer service sector. What advice would you give to someone just starting out in customer service? I’d say to really invest in the industry you’re working for; the more passionate you are about something, the more you’ll enjoy it!